AWS Documentation » Amazon ECS » Developer Guide » What is Amazon Elastic Container Service? Amazon Elastic Container Service (Amazon ECS) is a highly scalable, fast, container management service that makes it easy to run, stop, and manage Docker containers on a cluster. You can host your cluster on a serverless infrastructure that is managed by Amazon ECS by launching your services or tasks using the Fargate launch type. For more control you can host your tasks on a cluster of Amazon Elastic Compute Cloud (Amazon EC2) instances that you manage by using the EC2 launch type. For more information about launch types, see Amazon ECS Launch Types. 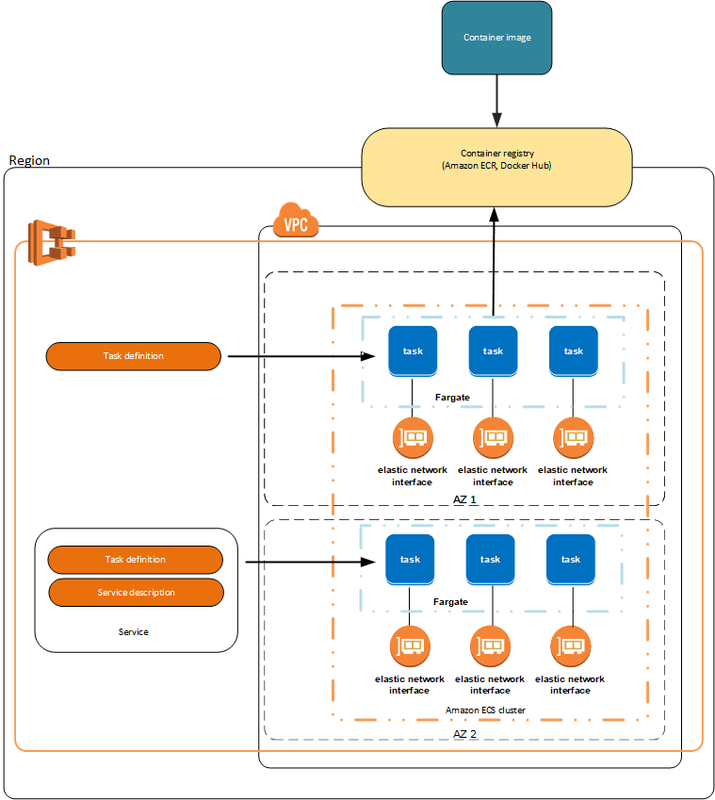 Amazon ECS can be used to create a consistent deployment and build experience, manage, and scale batch and Extract-Transform-Load (ETL) workloads, and build sophisticated application architectures on a microservices model. For more information about Amazon ECS use cases and scenarios, see Container Use Cases. AWS Elastic Beanstalk can also be used to rapidly develop, test, and deploy Docker containers in conjunction with other components of your application infrastructure; however, using Amazon ECS directly provides more fine-grained control and access to a wider set of use cases. For more information, see the AWS Elastic Beanstalk Developer Guide. The following sections dive into these individual elements of the Amazon ECS architecture in more detail. To deploy applications on Amazon ECS, your application components must be architected to run in containers. A Docker container is a standardized unit of software development, containing everything that your software application needs to run: code, runtime, system tools, system libraries, etc. Containers are created from a read-only template called an image. Images are typically built from a Dockerfile, a plain text file that specifies all of the components that are included in the container. These images are then stored in a registry from which they can be downloaded and run on your cluster. For more information about container technology, see Docker Basics for Amazon ECS. To prepare your application to run on Amazon ECS, you create a task definition. The task definition is a text file, in JSON format, that describes one or more containers, up to a maximum of ten, that form your application. It can be thought of as a blueprint for your application. Task definitions specify various parameters for your application. Examples of task definition parameters are which containers to use, which launch type to use, which ports should be opened for your application, and what data volumes should be used with the containers in the task. The specific parameters available for the task definition depend on which launch type you are using. For more information about creating task definitions, see Amazon ECS Task Definitions. The following is an example of a task definition containing a single container that runs an NGINX web server using the Fargate launch type. For a more extended example demonstrating the use of multiple containers in a task definition, see Example Task Definitions. Each task that uses the Fargate launch type has it's own isolation boundary and does not share the underlying kernel, CPU resources, memory resources, or elastic network interface with another task. The Amazon ECS task scheduler is responsible for placing tasks within your cluster. There are several different scheduling options available. For example, you can define a service that runs and maintains a specified number of tasks simultaneously. For more information about the different scheduling options available, see Scheduling Amazon ECS Tasks. When you run tasks using Amazon ECS, you place them on a cluster, which is a logical grouping of resources. When using the Fargate launch type with tasks within your cluster, Amazon ECS manages your cluster resources. When using the EC2 launch type, then your clusters are a group of container instances you manage. An Amazon ECS container instance is an Amazon EC2 instance that is running the Amazon ECS container agent. Amazon ECS downloads your container images from a registry that you specify, and runs those images within your cluster. 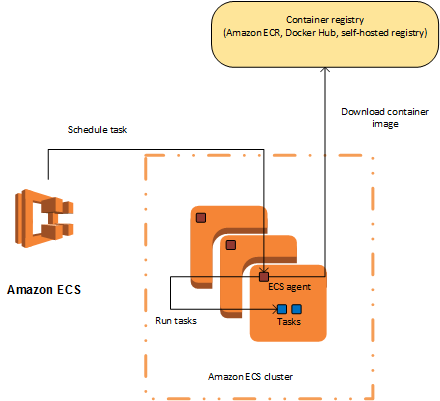 For more information about creating clusters, see Amazon ECS Clusters. If you are using the EC2 launch type, you can read about creating container instances at Amazon ECS Container Instances. The container agent runs on each infrastructure resource within an Amazon ECS cluster. It sends information about the resource's current running tasks and resource utilization to Amazon ECS, and starts and stops tasks whenever it receives a request from Amazon ECS. For more information, see Amazon ECS Container Agent. If you are using Amazon ECS for the first time, the AWS Management Console for Amazon ECS provides a first-run wizard that steps you through defining a task definition for a web server, configuring a service, and launching your first Fargate task. The first-run wizard is highly recommended for users who have no prior experience with Amazon ECS. For more information, see the Getting Started with Amazon ECS tutorial. Alternatively, you can install the AWS Command Line Interface (AWS CLI) to use Amazon ECS. For more information, see Setting Up with Amazon ECS. IAM is a web service that helps you securely control access to AWS resources for your users. Use IAM to control who can use your AWS resources (authentication) and what resources they can use in which ways (authorization). In Amazon ECS, IAM can be used to control access at the container instance level using IAM roles, and at the task level using IAM task roles. For more information, see Amazon ECS IAM Policies, Roles, and Permissions. Auto Scaling is a web service that enables you to automatically scale out or in your tasks based on user-defined policies, health status checks, and schedules. You can use Auto Scaling with a Fargate task within a service to scale in response to a number of metrics or with an EC2 task to scale the container instances within your cluster. For more information, see Service Auto Scaling. Elastic Load Balancing automatically distributes incoming application traffic across the tasks in your Amazon ECS service. It enables you to achieve greater levels of fault tolerance in your applications, seamlessly providing the required amount of load balancing capacity needed to distribute application traffic. You can use Elastic Load Balancing to create an endpoint that balances traffic across services in a cluster. For more information, see Service Load Balancing. Amazon ECR is a managed AWS Docker registry service that is secure, scalable, and reliable. Amazon ECR supports private Docker repositories with resource-based permissions using IAM so that specific users or tasks can access repositories and images. Developers can use the Docker CLI to push, pull, and manage images. For more information, see the Amazon Elastic Container Registry User Guide. AWS CloudFormation gives developers and systems administrators an easy way to create and manage a collection of related AWS resources, provisioning and updating them in an orderly and predictable fashion. You can define clusters, task definitions, and services as entities in an AWS CloudFormation script. For more information, see AWS CloudFormation Template Reference. You can use the AWS command line tools to issue commands at your system's command line to perform Amazon ECS and AWS tasks; this can be faster and more convenient than using the console. The command line tools are also useful for building scripts that perform AWS tasks.